Forum Eerste Wereldoorlog :: Bekijk onderwerp - The eastern front and Russia. The eastern front and Russia. Geplaatst: 28 Dec 2008 10:52 Onderwerp: The eastern front and Russia. During the rule of Nicholas II as czar of the Russian Empire since 1894, the country showed some signs of modernizing. By 1905, the Trans-Siberian Railroad, although poorly built and maintained in sections and with a gap at Lake Baikal, tied the capital in St. Petersburg with the Pacific Ocean port city of Vladivostok. Industries flourished, particularly near the capital and in the Polish, Lithuanian, and White Russian provinces of the empire. Economic progress did not bring political or social modernization, however. When the czar’s secret police, the Okhrana, infiltrated and broke up labor unions, the heavy-handed treatment provided a fertile ground for agitation by radical socialists, organized into the Social Democratic Party and the Social Revolutionary Party. Both these parties, although small, further split into left and right wings. After 1903 the Social Democrats divided between the more moderate Mensheviks and the radical Bolsheviks, whose leader, Lenin, argued that the party should not attempt to become a mass party, but should be open only to a dedicated revolutionary elite. He continued to run the Bolshevik branch of the Social Democratic Party in exile from Switzerland after 1912. Although some of the czar’s advisers and government ministers worked to modernize the administrative structure of government, Nicholas believed himself chosen by divine right to make crucial decisions and to lead the country. The Duma, an elected body representing the propertied classes, could make recommendations, but remained relatively powerless to oppose or modify the decrees of the czar. Like his predecessors, Nicholas II took his commitment to the empire seriously, hoping to resolve its international security questions by territorial gain or by concessions from traditional opponents. Blocked from access to the Mediterranean by Turkish control of the Bosporus and Dardanelles, Russia sought influence on the Balkan Peninsula, among the Serbs, and among the Armenian population of Turkey. Throughout the 19th century, Britain had opposed Russian expansion in the Black Sea and had encouraged the Ottoman Empire to block Russia’s entry via the Bosporus to the Mediterranean Sea, but the czar had welcomed the alliance with France and Britain. When Nicholas declared war on Germany and Austria-Hungary in August 1914, the Russian arms industry stumbled along, disorganized and unproductive. Yet shipments of weapons from the Allies, together with the vast reserves of Russian manpower should be sufficient, the czar and his advisers believed, to put up a credible showing against the Central Powers. If Germany and Austria were quickly defeated, Russia might gain its longtime objective of security on its southern frontier with Turkey. When Turkey joined the Central Powers and the Allies promised to support Russia in its goals to gain control of the Bosporus, it appeared Russia would achieve some long-standing aspirations. With Germany engaged with France, and Austria struggling to suppress Serbia, each of the Central Powers would be at the disadvantage of fighting on two fronts. 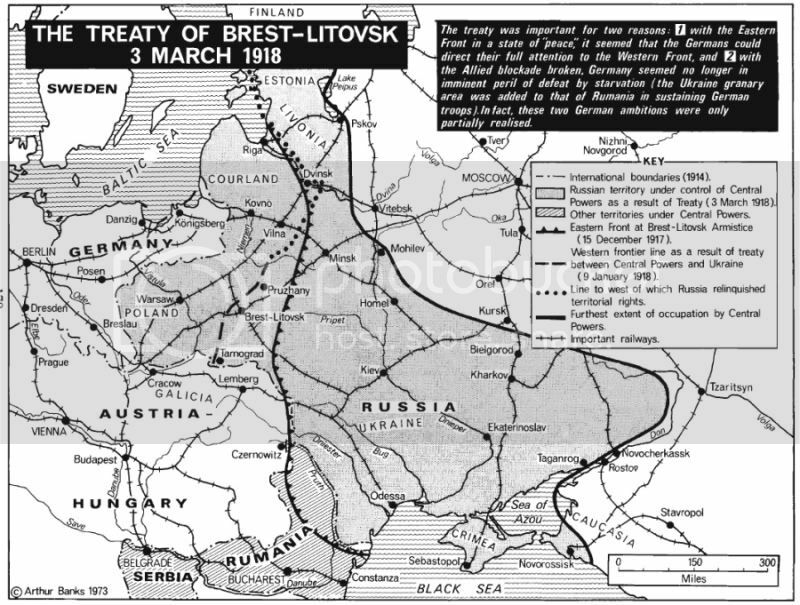 Geographically, it made good sense, as Russian troops could push into the East Prussian province of Germany from Russian Poland. Looked at from a simple strategic or geopolitical viewpoint, the alliance of Russia with France and Britain against the German Empire appeared brilliant. The czar and his advisers could make a similar evaluation regarding the Austro- Hungarian Empire. Germany’s Habsburg ally controlled restless populations of Ukrainians and Poles in Bukovina and Galicia, frontier provinces directly on the doorstep of Russia. With a rapid push through these provinces into the Carpathian Mountains, Russian armies could come to the aid of Serbia by threatening the heartland of Austria-Hungary itself. The prospects for an early victory, in Russian eyes, seemed imminent. However, the Russian generals and aristocrats, like their counterparts in the rest of Europe, had very little understanding of the many ways in which warfare had changed. They predicted victory based on the outmoded and faulty premise of simple calculations of available manpower and distances to be traversed, making the sort of Napoleonic-era calculations common among their counterparts in the west. Just as in Germany, France, and Britain, millions of Russian volunteers offered their services to the army, and the politically divided country appeared united and ready for a patriotic war. Even the socialists, including the Menshevik wing of the Social Democrats and both the Right and Left Social Revolutionaries, joined in endorsing the war against the Central Powers. Only the Bolsheviks protested. They reluctantly followed the advice of Lenin from exile to oppose going to war. He believed that all working people in Russia should join with their brothers in the Central Powers in resisting the war, in a socialist-led front against the capitalist powers. However, Lenin’s cry for class solidarity in the face of the war met no response either in Russia or among socialists in Germany. Russian liberals, other socialists, and of course conservatives widely decried Lenin and his followers for lack of patriotism in time of war. Some accused Lenin of working as a German agent. Meanwhile peasants, workers, and the middle class thronged into army recruiting offices. In spite of Russian popular optimism, the war turned out to be neither short nor easy. For the Russian people, World War I and its aftermath of continuing armed conflict brought immense tragedy in loss of life on land and sea, of men wounded in battle, and in those held prisoners of war by the enemy. Russia suffered some 8 million casualties when all these categories are considered together. Many of the battles and much of the devastation of homes, farms, businesses, and factories of World War I took place on lands that had long been part of the Russian Empire, including the Kingdom of Poland, White Russia, and Ukraine, all of which lay under the rule of the czar. Following the battles across the face of eastern Europe is made difficult for the modern student of the subject, because the boundaries of the various countries in eastern Europe have changed several times over the decades since the war. Frequently a city or fortress located in the provinces of Russian Poland, White Russia, or Ukraine in World War I is now found under a new national jurisdiction. Many cities and provinces have different names than they had then. Russian troops moved first into the German province of East Prussia, located now in the northeastern region of Poland and in the Russian province of Kaliningrad Oblast, geographically separate from the rest of Russia. Two Russian armies, expecting a quick victory, marched from Russian Poland into German East Prussia. The First Army made a strong advance across what is now the border between Lithuania and the Kaliningrad Oblast toward the city of Kaliningrad, then known as Koenigsberg. The German forces fell back in August, yielding German territory to this first success. Farther to the south, the Russian Second Army took up positions near the town of Tannenberg inside East Prussia after meeting light resistance. Although the territorial gains in East Prussia represented only a small advance in the estimation of Britain and France, the rapid Russian offensive drew off German troops, in effect saving Paris from the German onslaught in the west in the first weeks of the war. Although it cost valuable resources Germany would have preferred to pour into Belgium and France on the western front, German commanders rapidly moved forces by rail to Tannenberg where they drove back the Russians in an extended battle, August 26–30. A week later, the Battle of Masurian Lakes drove the Russian First Army back across the frontier, there marked by the Nieman River. By mid-September, the Russian invasion of East Prussia had come to an ignominious end. The Germans took more than 90,000 Russian prisoners. General Alexander Samsonov, commander of the Russian Second Army, retreating on foot with his troops, became lost in the woods on the retreat, and then, by some accounts, committed suicide on August 29. Farther to the south, Russian forces advanced into the province of Bukovina, now in the nation of Ukraine, but then a frontier province of the Austro-Hungarian Empire, running along the Carpathian Mountains that presented a barrier to invasion into Hungarian-ruled Transylvania. The Russian forces threatened to advance through the Carpathians into those lands at the core of the Austro- Hungarian Empire. In another advance, the Russians besieged an Austrian-held fortress city at Przemysl, now on the Polish side of the southern border with Ukraine. Cut off from Austrian supply lines, the defenders and citizens, mostly sympathetic to the Russians, began to starve before finally capitulating. German and Austrian forces mounted a counterattack in early October that drove the Russians back through Russian Poland toward the Vistula River, with the Germans driving toward Warsaw itself. In southern Poland through November and December, the Russians held back the Austrian advance at Cracow, although the Germans took the city of Lodz in Poland, about 60 miles southeast of Warsaw. By the end of 1914, German forces had pushed Russian troops well back into Russian Poland, halting the threat to the eastern German province of Silesia; farther south, the Austrians held a line against the Russians in the Carpathian Mountains between Galicia and Hungarian Czech lands. 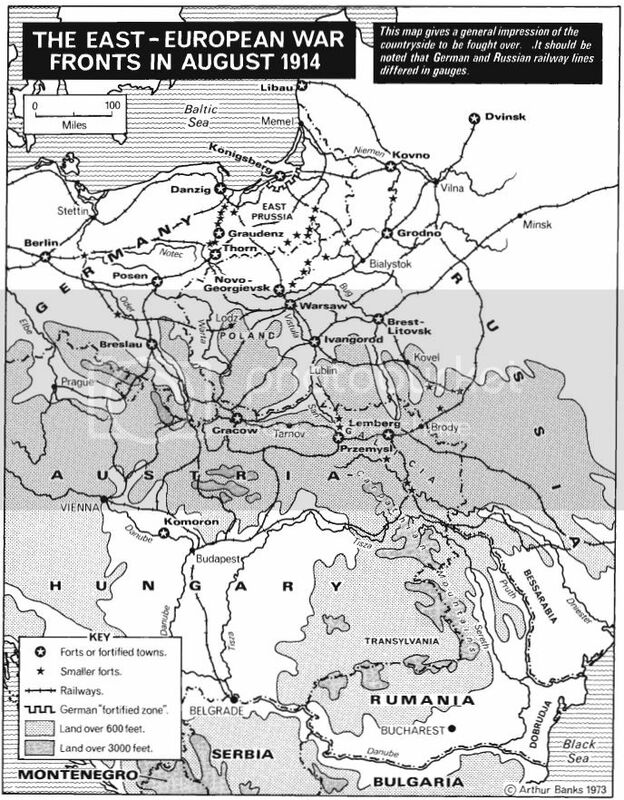 That line held through the 1914–15 winter, and the Russians did not attempt to pass through the Carpathians until March 1915. 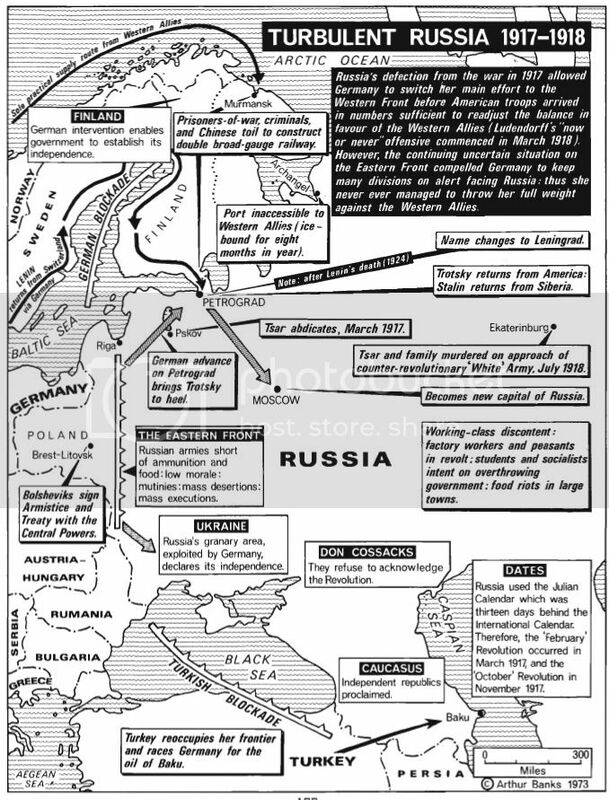 By the end of April 1915, the Russian advance ground to a stop. Meanwhile, in the winter months of February and March, the Germans advanced to take the Baltic coastal city of Memel, in what is now Lithuania. After bitter back and forth fighting, the Germans gained Memel by the end of March and then made further advances into Lithuania. By the summer of 1915, the Germans and Austrians began a gradual advance, pushing back the Russian troops first in Galicia and southern Poland. By the end of June, Austrians had regained control over their provinces of Galicia and Bukovina. They recaptured the fortress at Przemysl and moved on to the city of Lemberg (now L’vin) in Russian Ukraine. In a major offensive, German and Austrian troops continued to push forward. By August, they had taken Warsaw and, by the end of the month, moved on to Brest-Litovsk in eastern Poland (now right on the border between Poland and Belarus). With these advances, the Central Powers had moved well into the Russian Empire by fall 1915. With these events, even ordinary citizens in Russia realized that the empire would have no easy victories, that the officers gave poor leadership, and that the Central Powers by contrast had well-organized and determined forces. In September 1915 Czar Nicholas II relieved his nephew, Grand Duke Nicholai, of command of the Russian military. The czar took over the position of minister of war for the remainder of his reign. Like his nephew, however, the czar faced problems of troop morale, supply, and lack of imagination and experience among officers that he could not do very much about. By the end of September the Germans had moved well into Lithuania. 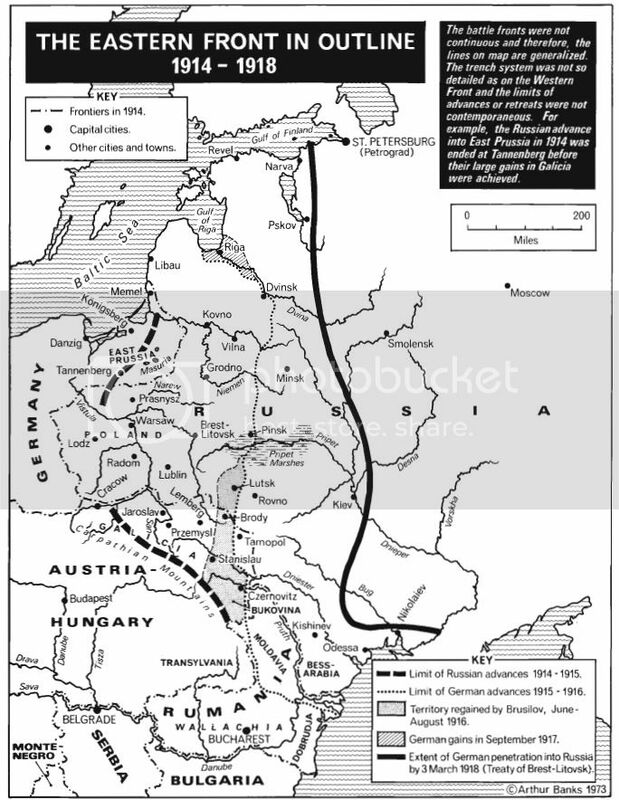 German forces controlled a line running north and south between the cities of Minsk and Pinsk in Belarus; the line continued southward under Austrian control, taking in almost all of Galicia, including the city of Czernowitz in the Ukraine. After the Battle of Tannenberg in the first month of the war, the front had moved slowly to the east. Compared to the western front that remained stalemated in a narrow band stretching from the North Sea to Switzerland, the eastern front showed a gradual wearing down of the Russian forces and the loss of territory to the Central Powers. Even though the defense had a natural advantage under the conditions of World War I combat, with trenches, strong points, and machine guns holding the line against artillery bombardment and marching troops armed only with rifles and grenades, the defense could hold only if well-supplied with ammunition and manned by willing troops. However, Russia remained plagued with incompetent officers leading dispirited troops who lacked weapons and ammunition. Russian factories could not produce modern weapons, and, with the only access for Allied shipments through the ports of Murmansk and Archangel frozen in during the winter, weapons from the west could not augment the meager Russian supply. Efforts to modernize the Russian arms industry proceeded, but slowly and with very meager results. Nicholas appointed the one officer with a record of success, General A. Brusilov, as commander of the forces on the Russian Southern Front, in April 1916. 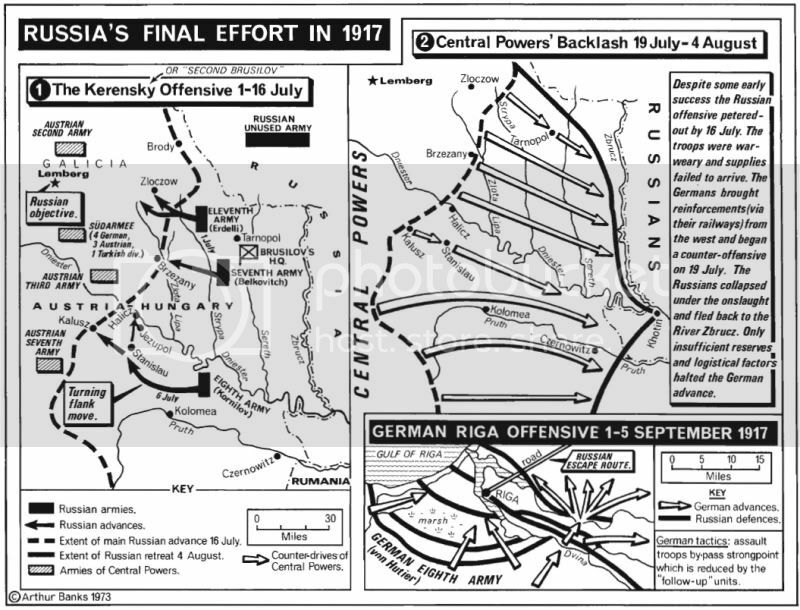 In a last push forward, known as the June Offensive or the Brusilov Offensive, Russian troops spent the summer of 1916 in an attempt to retake Lemberg in the Ukraine and Lublin in Poland. Before their advance stopped, some in the west took encouragement, believing that the tide had turned on the eastern front. Brusilov’s forces regained some lost ground in Galicia. Whole units of Czech troops in the Austro-Hungarian army deserted to the Russian side. Not a huge army by the standards of the day, nevertheless, the Czech Legion of experienced and dedicated soldiers, numbering about 50,000, represented an impressive addition to Allied strength. Furthermore, under Brusilov’s command, the Russian forces took more than 350,000 prisoners, mostly from the Austro-Hungarian forces. As a consequence of the Russian successes against the Austrians, the Germans convinced the Austro-Hungarian officers to accept a unified command under German control, noted with some satisfaction by General Erich von Ludendorff. In Russia at the end of 1916, the leadership still believed that, if they held their line, with an eventual Allied victory, Russia would emerge with territorial gains and access to the Mediterranean through the Bosporus and Dardanelles, as promised by the British in their secret treaty. However, the Brusilov offensive cost the Russians more than a million casualties and made only modest advances toward its objectives. Although the Russian army had suffered severe casualties, as yet no major mutinies among the troops had erupted. The Russian military position had grown difficult, but not desperate. Brusilov moved the battle lines back somewhat to the west. Encouraged by the Russian advances, Allied promises of support, and pledges to endorse the acquisition of the territory of Transylvania from Austria-Hungary, Romania joined the Allies in August 1916. At first the Romanian forces advanced and took the city of Sibiu in Transylvania, but, by September, Austrian forces surrounded the advanced salient of Romanian troops there. To add to these problems faced by Romania, its southern neighbor, Bulgaria, a member of the Central Powers since October 1915, had designs on Romanian territory. Even though French and British forces withdrawn from Gallipoli assembled at Salonika to threaten Bulgaria from the south, they made no advance. Soon the Central Powers nearly overran Romania, with German and Bulgarian forces moving through the Romanian coastal lands on the Black Sea and taking most of the province of Dobrudja. By November, German forces advanced on the Romanian capital, which the Romanian government abandoned in December, taking refuge in the provincial town of Jassy near the Russian border. The Provisional Government presided over the beginnings of the breakup of the Russian Empire. In March and April, the government recognized the independence or autonomy within the empire of Finland, Poland, and Estonia. At the same time, the Provisional Government continued to prosecute the war. Kerensky became minister of war on May 16, and, six weeks later, General Brusilov began an offensive in Galicia with the objective of retaking Lemberg. However, Kerensky and Brusilov faced a major mutiny among the troops in mid- July, partly brought on by the breakdown of morale and encouraged by radical newspapers circulated to the front and passed from hand to hand and read out loud for the majority of illiterate soldiers. Hundreds of troops shot their officers, abandoned the front line, and retreated in disorganized, but still armed bands into the Ukraine by mid-July. The Provisional Government put down an unsuccessful attempt of armed workers, supported by the Bolsheviks, to seize power in Petrograd as the troop mutiny began. After the put-down during these July days, the Provisional Government had Trotsky arrested. Finland declared complete independence from Russia, and Lenin found refuge from Russian arrest there. In the Executive Committee of the Soviet, N. N. Sukhanov, an astute and independent socialist, kept a close diary of the events, while at the French embassy, a young diplomat, Count Louis de Robien, observed events with sympathy for the oppressed workers, the brave revolutionaries, and the dispossessed members of the middle class and elite. Faced with the mutiny of soldiers, the abortive Bolshevik coup attempt, and constant agitation, the liberal prince Lvov resigned as head of the government, to be replaced by Kerensky, who remained in that office from July 20 until November 1917. Kerensky did not round up the mid-level and rank-and-file Bolsheviks, a tactical mistake, for it allowed Lenin to maintain contact with his supporters from his nearby Finnish exile. Despite his reputation as a sympathetic socialist, Kerensky had no success in restoring troop morale, and, by the end of July, the mutiny among troops had spread. Austrian and German forces retook all of Galicia. The disorganized retreat of the Russian army gave up all the territory Russia had gained over the previous two years of fighting. Although Kerensky won admiration in the west for his pronouncements of civil liberties, the unrest among the populace began to outstrip even the socialist prime minister’s reforms, while continuing losses on the war front and desertions of troops worsened his position. In August, factory workers went on strike in a demand that the war be ended. Kerensky replaced General Brusilov with General Lavr Kornilov. To restore order in Petrograd, Kerensky ordered Kornilov to bring reliable troops to the city. However, rumors reached Kerensky that Kornilov planned a military coup to seize power, so Kerensky dismissed Kornilov and rescinded the order. Bolshevik union members cooperated in diverting Kornilov’s train, and organized factory workers poured into the streets to protect the revolution from the threat of Kornilov’s counterrevolutionary troops. The Bolshevik party took some credit for forestalling the expected Kornilov coup attempt. Meanwhile, the Bolsheviks continued to maneuver in the Petrograd Soviet, and by October they had established a majority there. Pressured from both the left and the right, Kerensky found himself increasingly isolated. His talents as a speaker soon proved inadequate to provide answers to the dilemmas of the Provisional Government.